Flexco Products’ CEO Tom Jellison calls it a “record installation”—a 10-day crisis period that had Flexco’s workforce decommission an old, broken stamping press and install and commission a replacement press. The new machine, a 330-ton Seyi model SAG 330, with 48 by 96-in. bed, was needed to maintain production schedules for Flexco’s lineup of metal folding steps, built for recreational vehicles. This new Seyi 330-ton press stamps parts for Flexco’s line of metal folding steps at 35 to 40 strokes/min., a nice increase compared to the firm’s 1950s-vintage press that previously ran at 25 strokes/min. 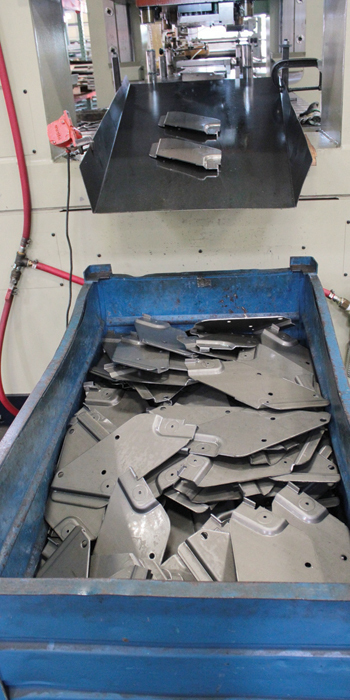 Flexco is located in the heart of RV country, in Elkhart, IN, and when its 60-yr.-old press used to stamp step components broke last March, the firm had little time to find a replacement, as the season for RV production was entering high gear. The seven dies—two- to four-station progressive dies—that run on the press stamp out hot- and cold-rolled steel, 0.072 to 0.250 in. thick. The press runs two shifts to produce annual volumes approaching 500,000. Comparing old to new, Jellison notes that the original 1950s-vintage press ran at 25 strokes/min. The new Seyi, rated to 50 strokes/min., runs at 35 to 40 strokes/min., a productivity increase that has Jellison quoting new work for the press, including a 10-station progressive die required to produce 1.5 million parts/yr. 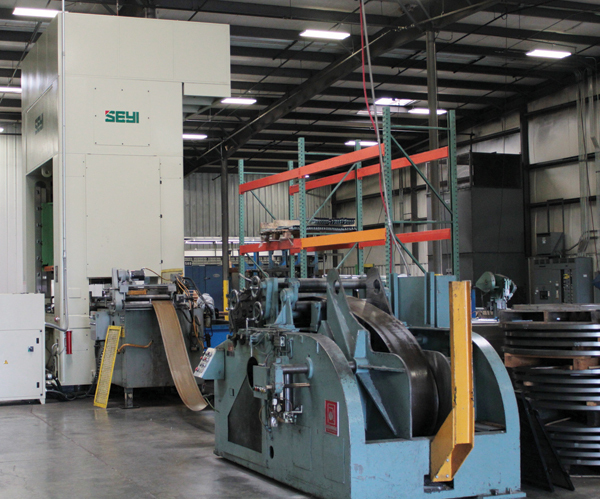 Seyi’s SAG series of presses marry a heavy-duty tie-rod frame with full eight-point gibbing. The bed and slide design comprise a honeycomb structure that meets or exceeds 0.0012 in./ft. deflection with load distributed over two-thirds of the die area. The center drive structure, says Jellison, proves ideal for progressive and transfer applications, as it eliminates torsional twist that typifies end-drive presses. Because Flexco runs a variety of dies on its SAG-330, the press’s 10-in. motorized slide adjustment and adjustable air counterbalances has reduced setup times and increased throughput. 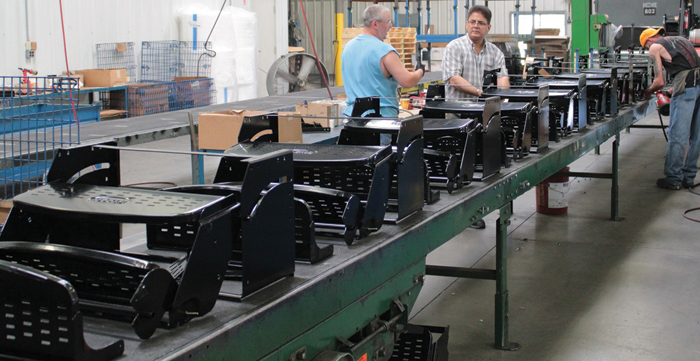 Shown: Stamped folding-step parts exiting Flexco’s new press, and assembled steps moving through a production line. With the press upgrade, Flexco’s crew enjoys a multitude of new die, press and operator protection benefits. A first line of protection comes from a quick-response hydraulic overload protection (HOLP) system. The HOLP can be manually released at any point in the stroke and automatically resets when the slide returns to top-dead center. A Wintriss SmartPac2 control, with WPC 2000 clutch/brake control, adds further protection while integrating the complete press line. The standard eight-channel die protection monitors as many as eight inputs from a variety of electronic and mechanical sensors that mount to the press or die. And, a four channel tonnage monitor tracks and controls critical performance parameters. Flexco integrates the line’s coil feeder via adjustable cams, allowing for setting of accurate, repeatable timing. Eight cams come standard, helping Flexco to also easily integrate its lubrication system and, down the road, add part and scrap conveyors. Flexco’s new press joins eight additional stamping presses occupying a 60,000-sq.-ft. building on the firm’s sprawling campus in Elkhart. In addition to RV steps, the building’s inventory of presses as well as additional fabricating and finishing equipment—lasers, press brakes, robotic-welding cells, a powder coating line, etc.—turns out cam locks, bar locks and strap hinges for the cargo-trailer industry, and a line of continuous hinges. “We’re a full-blown custom fabricator,” says Jellison, noting that the firm serves more than 1000 customers and produces more than 30,000 part numbers. In all, its manufacturing campus houses 25 buildings, eight of which are used regularly for production. The firm even maintains its own material-processing plant, to satisfy inhouse needs as well as service other metal-fabrication shops. Flexco purchases material direct from the mills and performs cut-to-length operations, corrective leveling and coil-to-coil slitting. Its steel-processing operation features a Braner 72-in. looping-pit slitting line that can process coils from 30 gauge to ¼ in., outfitted with an automated packaging conveyor. In addition to operating some 20 stamping presses throughout its complex, the firm also maintains a fleet of eight CNC turret presses—most outfitted with automatic load/unload systems—and three laser-cutting machines. Its latest investment is a 4-kW laser from Han-Kwang USA. “I purchase new equipment every year,” says Jellison, noting his commitment to keeping the shop updated with the latest-greatest equipment that began when he launched the firm in 1977. Technology holds the key to enabling the company to respond quickly to customer requirements. What’s next on Jellison’s wish list for new technology?